Summer. Fall. Winter. Spring. When are you coming to Big Sky? People often wonder what is the best time of year to visit Big Sky. We're here to tell you that there is no bad time to be come to Montana's coolest mountain town. Every season and every month is cool and unique in Big Sky. It's up to you to choose the best month for your trip. Whenever you come, you won't be bored. 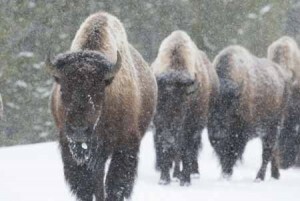 There's an endless supply of things to do in Big Sky - skiing, hiking, fishing, climbing, golfing, biking, snowmobiling, wildlife spotting, national parks, camping, and so much more. The hardest part of life in Big Sky is deciding what to do next! Besides the outdoor activities, one of the great things about Big Sky is that it always feels like you have the entire place to yourself (especially if you've been to other mainstream four-season resorts). Come and see for yourself. Big Sky will blow your mind. But back to your original question, When is the best time of year to visit Big Sky? The "busy" seasons are during the winter ski season and during the summer months. Both of these seasons are very different, but equally awesome - although we all have our favorite season. January - Average High/Low in °F: 31/8 - January is a quiet time to go skiing and the snow is ready to go. January is a great place to start your New Year. February - Average High/Low in °F: 35/8 - February is a snowy month. Tie in your trip with the annual Big Sky Big Grass Festival and enjoy bluegrass and skiing! March - Average High/Low in °F: 43/16 - Spring break is in the air. The temps are warming up and the days are getting longer. March is known for huge snowfall and bluebird days. It's prime time for snowmobiling, cross country skiing, and tram laps! April - Average High/Low in °F: 50/22 - Big Sky's winter season comes to an end in mid April and it's prime time for spring skiing! Now is the time to celebrate a fun winter - especially with closing weekend and Pond Skim. Warmer temps and blue skies make it a great time to go skiing before it's too late. 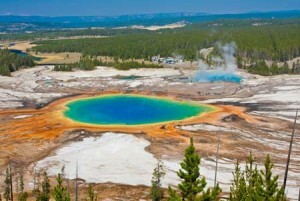 It's also the month when Yellowstone National Park opens for the summer. Come in April and get the best of both worlds. May - Average High/Low in °F: 59/29 - May is beautiful. Hiking trails are melting out, wildflowers are coming into bloom, wildlife is everywhere, backcountry skiing is fantastic, and biking season begins. It's super quiet around here, but that just adds to the allure of this sleepy month. June - Average High/Low in °F: 68/36 - June kickoffs the summer season in Big Sky. 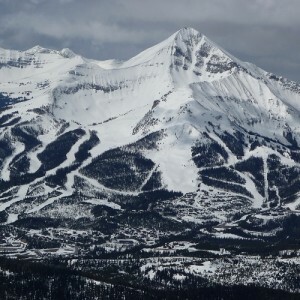 Big Sky Resort opens for the summer. The Big Sky Farmer's Market and Music In The Mountains Free Summer Concert Series start. The days are warm and nice. The snow line creeps uphill and it's time to start venturing off on longer hikes and further bike rides - or head into the YNP for an adventure. July - Average High/Low in °F: 78/40 - July is always hopping with fun events. Between outdoor activities, the Music In The Mountains Free Summer Concert Series, Big Sky Farmer's Market, 4th Of July Celebration, Big Sky Fly Fishing Festival, Brewfest 2016, and Big Sky PBR there's a lot crammed into this busy month. The temps are perfect for just about any outdoor adventure and you'll see smiling faces everywhere. August - Average High/Low in °F: 77/39 - August is another ideal summer month. 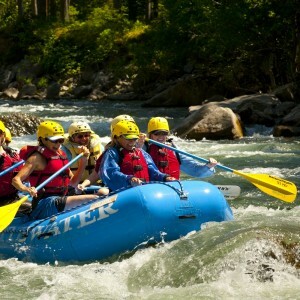 The weather is perfect and the days are long, which means you can do all the things on your bucket list - peak bagging, hiking, golfing, rafting, Yellowstone, etc. Combine perfect days with cool activities like Music In The Mountains Free Summer Concert Series, Big Sky Farmer's Market, Big Sky Classical Music Festival, Vine and Dine Festival, and more and you'll probably fall in love with Big Sky. September - Average High/Low in °F: 68/32 - The end of September marks the end of the "summer season." 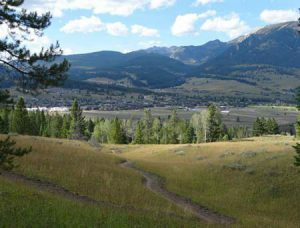 Big Sky resort closes for the summer after hosting the RUT mountain race and other cool events. Music In The Mountains Free Summer Concert Series wraps up their season. This is your last chance to enjoy all the fun things that summer offers. October - Average High/Low in °F: 54/24 - October can bring all types of weather. It can be super nice and also start to snow. The mountains will usually receive their first coat of snow marking that winter is near. Come to Big Sky in October and take advantage of the tail end of summer or to get excited about winter. November - Average High/Low in °F: 38/15 - November is a sleepy month. It's usually obvious that winter is coming as the snow coats the mountains, then when Thanksgiving hits - it's opening day at Big Sky. Ski season is back and it's time to hit the slopes. December - Average High/Low in °F: 28/6 - December is often a "busy" month in Big Sky. Everyone wants to get back on skis because skiing is awesome. The snow is falling regularly and the excitement level is high. Check the Visit Big Sky Event Calendar for a full list of cool events happening in Big Sky. Come and experience Big Sky's growing community and play in our outdoor paradise. You're always welcome here. Need help planning your trip? Get free info about Big Sky on the Visit Big Sky website and on our blog. When you arrive, stop by The Big Sky Visitor's Center. We're across from the Conoco near the only stoplight in town! We have all the info you need to make your trip to Big Sky the best vacation ever. When do you think is the best time of year to visit Big Sky? That's for you to decide. Have fun planning your trip. See you soon! For more monthly weather information visit USClimateData.com.